AX Framework brings along some very exciting new concepts, that might change the way you think web application development forever. 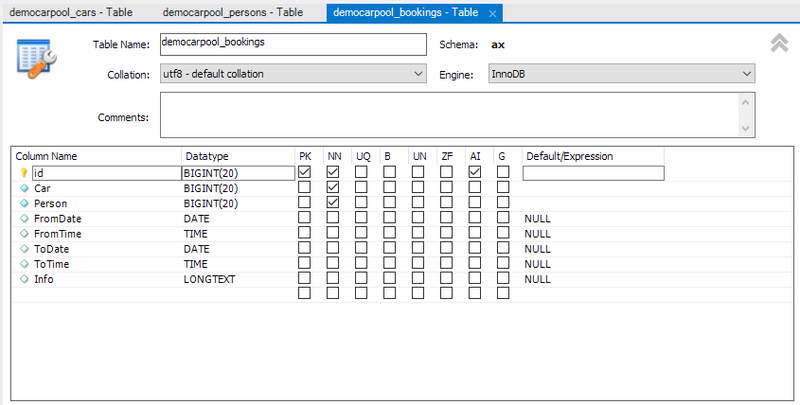 With AX Framework you no longer think of your application in endless complex-logic view layouts, but in seperate layers of object representation, that will make your source code lean, clean, compact, efficient and rock-solid. With all being windowed content, you will rethink intranet development. You will concept your project in dynamic, data-object related pages and multiforms. A Page is requested by the client; either the user has clicked a) on a link on another page, b) on a link on his desktop, or c) he chose an entry point from the the menusystem. In most cases, this call typically comes with an id, that refers to the specified dataset - the so-called DataOjbect-Id - which is the primary id of the primary data table. The MultiForm (client) gets initialized and asks the DataProcessor (server) for wanted layout and data. The DataProcessor (server) instanciates the necessary DataObject(s) and replies with form layout (XML) and the dataset in JSON format. Please note, that this is not a traditional MVC setup. While it might be true, that our DataObject somewhat corresponds to what is commonly known as «Model» and our DataProcessor might correspond to being a «Controller», nonetheless our Page, MultiForm do not really correspond to being a classic «View». We would still recommend to get a fresh view on our Model independently to all previous layouts. 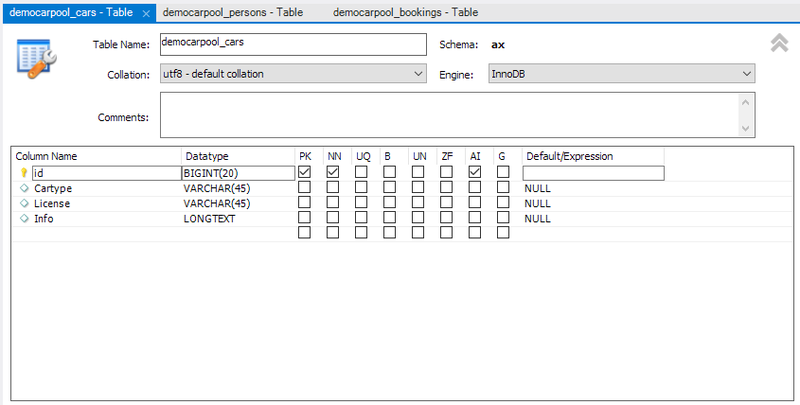 Here's a very run down example how a project (here: a simple carsharing module) could be built up within ax: Please keep in mind ax actually built for high comlex projects more than simple three table layouts. Let's imagine we have a bunch of cars at our disposal, which are being rented out to people we know. We would like to keep track of information about: Cars, Persons and Bookings. For this we will initialize three tables. 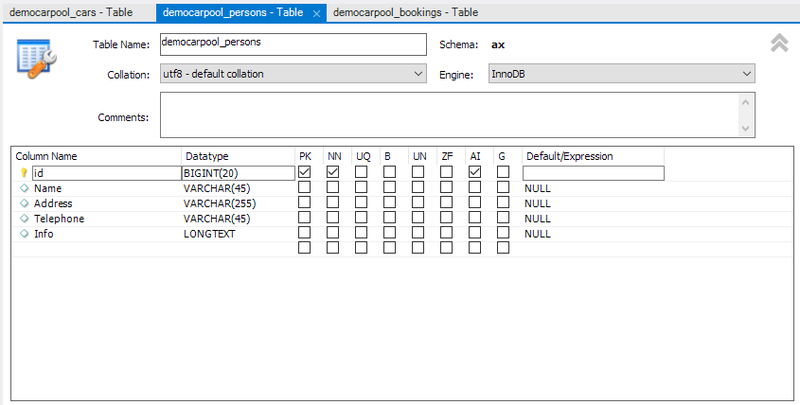 Let's use "Demo Carpool" as our project/module name. one DataObject(s) folder do/ holding as many DataObject(s) as you want. one DataProcessor folder dp/ holding as many DataProcessors as you want. one axMultiForm folder forms/ holding as many form definitions as you want. one Page folder pages/ holding as many pages as you want. 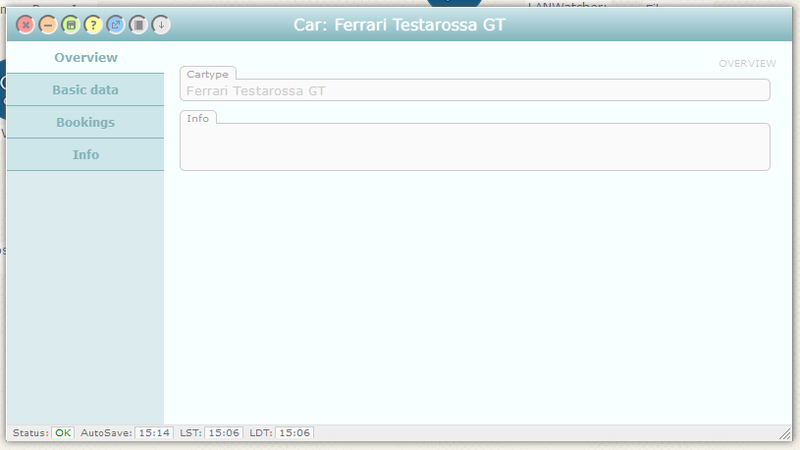 one sopts/ folder holding the bits of code necessary to display select options for Cars and Persons.